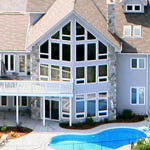 Click here to see exterior pictures of Big Bear and magnificant views of Jack Lake. The lower level of Big Bear features a master bedroom with ensuite, sitting area, billiards' game rooms and a home theatre. The lower level leads you out to the inground pool and hot tub. Click here to see more. This luxurious main floor includes living room with 30' fieldstone fireplace, a master bedroom complete with ensuite and secluded gazeebo, gourmet kitchen, Fitness gym and large lakeside deck with a million dollar view. Featuring a large master bedroom with fireplaces and ensuite, this 4 bedroom / 2 bathroom upper level is more than enough to accomodate all living arrangements.